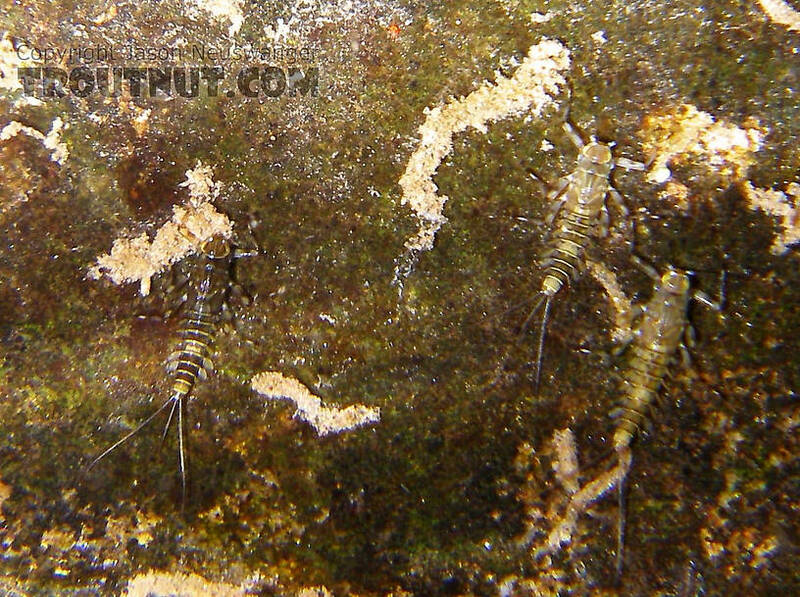 Arthropods include just about everything trout eat except for minnows, worms, and leeches. In this picture: Insect Family Formicidae (Ants). 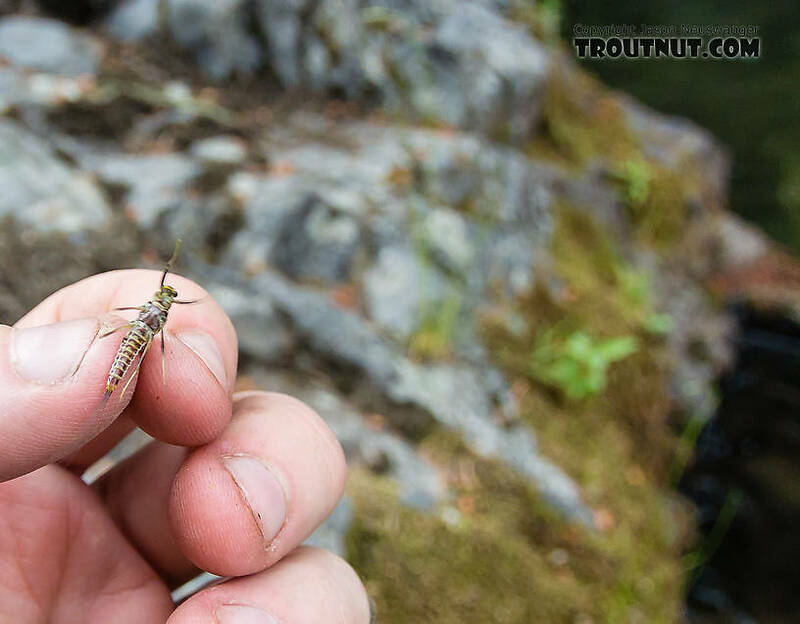 Callibaetis spinner on an alpine lake in Washington's Cascades, the one referred to by the alias of Upper Lake in my Golden Trout trip report. 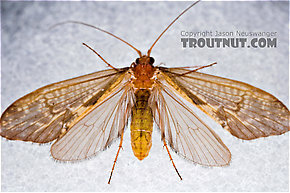 In this picture: Mayfly Genus Callibaetis (Speckled Duns). 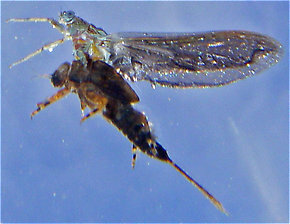 In this picture: Mayfly Species Drunella grandis (Western Green Drake). 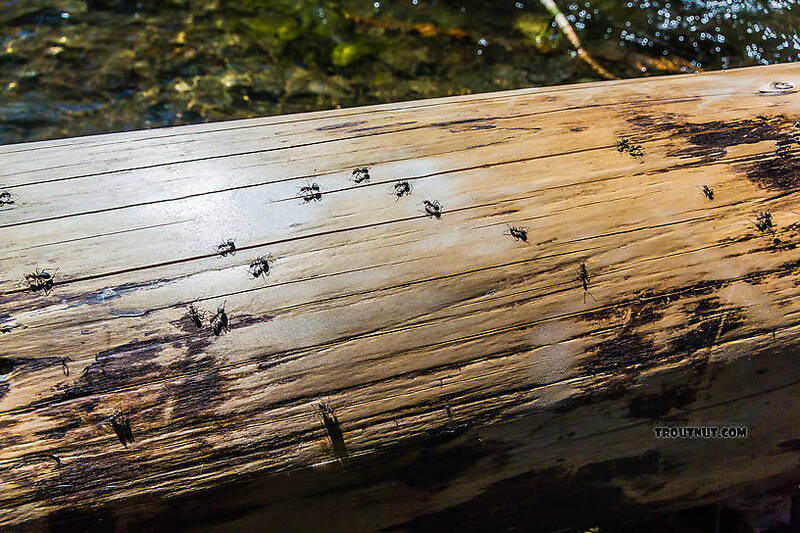 Hundreds of cased caddisfly larvae live on this log in a small brook trout stream. Anyone have experience fishing Trico emergers patterns? I’ve had experience fishing the winged and spinner stage, but haven’t heard of anyone fishing emergers during the early morning female hatch. 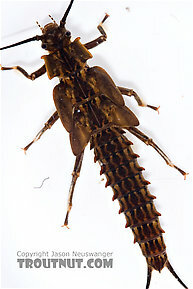 Anyone used emerger patterns and if so would you might sharing which ones you have found effective? I'll start with a fly patterns, follow with a bit of what I think I know about Tricos (Entomologists, please offer corrections if needed), and close with a few questions. I love designing different patterns for Tricos, partly to keep myself entertained, and partly to show the fish something new from time to time. Jason's photos and the opinions of some fussy fish have led me to tie an extra large thorax recently on all my Tricos. My old standby is a parachute tied reverse, with a high vis post over the bend of the hook, and grizzly hackle, with no tails. It's modeled on Al's Trico, which could be found on the Little Lehigh Flyshop website until Rod closed the shop. An internet search may provide images now. It's very visible and fish generally approve. 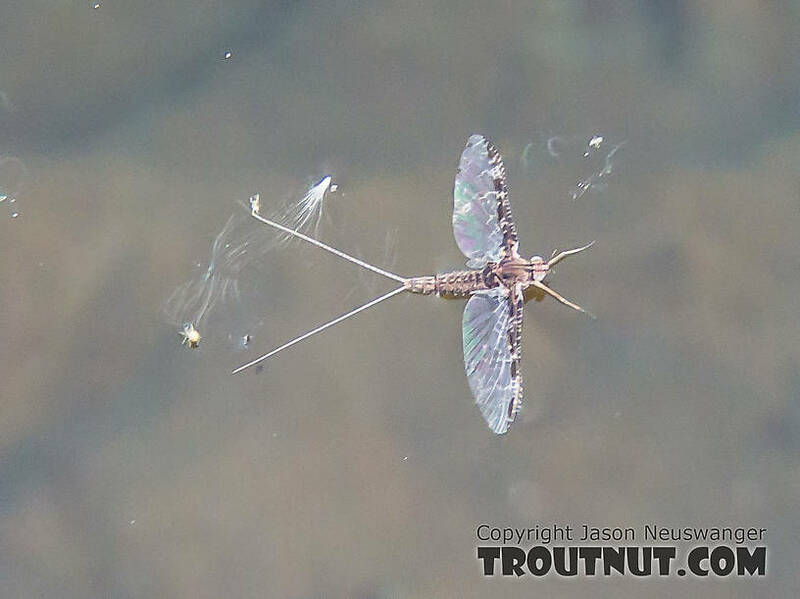 My newest fly is a take off from one of Gonzo's (Lloyd Gonzales) patterns in his book Fly-fishing Pressured Water, and it also shows the influence of Al's Trico. Gonzo ties an upside down Trico on a wide gap hook using synthetic material for the wing. I tie this fly also, and it certainly does catch fish, but I recently tied a version with grizzly hackle, making an oversize thorax and palmering hackle over the thorax to create a full wing. I then clipped hackle from the top of the fly (which becomes the bottom, as this is an upside down fly) so that the fly would sit flat, upside down, on my tying table. A drop of Locktite brush-on super glue on the bare recently clipped thorax after darkening the hackle stem with black marker and the fly was done. (By the way, I put tails on this one to balance it [P.S. Later correction: this pattern doesn't need the tails. I've caught plenty fish now on a tailless version] .) It caught several fish the first time I tried it on a heavily fished stream. I believe for some, if not most species of Tricos, males hatch at night, females in the morning, and that the spinners fall when the air temperature hits the upper 60's. This generally means that as the season goes on, spinners hit the water later and later. Sometimes by 7:00 am (or earlier) in the early summer, by 10:00 (or later) in the fall. It's been unseasonably cool in the Northeast the past couple of days, and I would have gone out this morning but for taking my daughter to a midnight showing of The Order of the Phoenix (I just couldn't get up) but I'm wondering if the spinner fall happens later than normal on cool mid-summer mornings like today's. I hope to find out Monday, but am curious if anyone has experiences to share. Also, does anyone have an effective Trico pattern to share? I'm always looking for ideas. 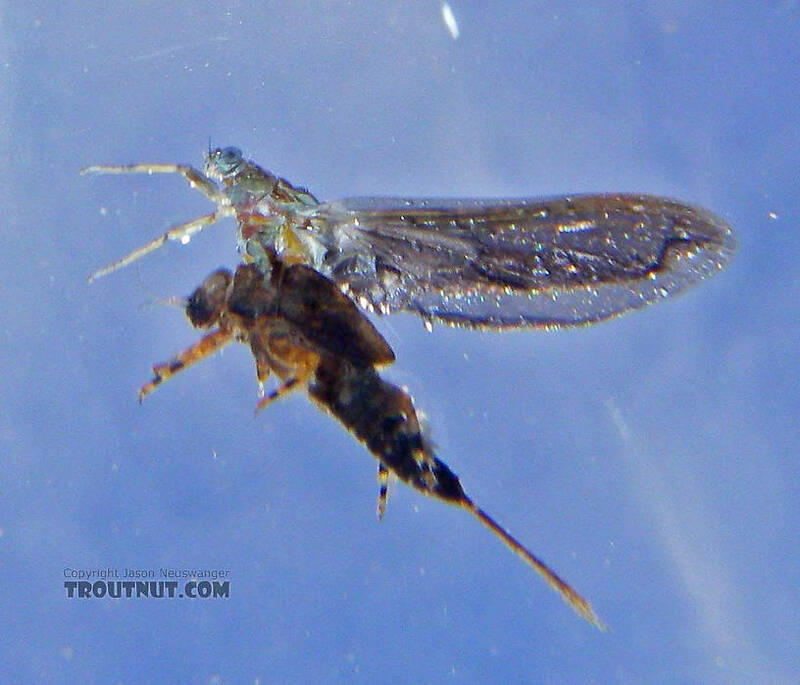 What are the differences between Baetis, Caenis and Tricorythodes may flies. I get different answers from different FF buddies. Hey guys, went out on the Neversink for awhile today and had a look around, saw a lot of little dark flies, may be the little black stone fly? 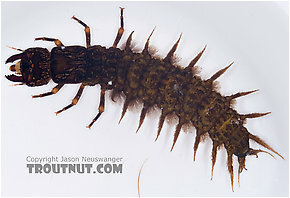 Hard to tell cuz looked like Caddis too. Looks like about a size 16? Any pics of available of this species would be great. I would like to see a picture of an emerging Chimarra or a pupa stage before emerging if anyone has one. I am baffled and curious to how and when they change from a yellow/orange larva to a black adult fly. Also, what would be a good emerger pattern for this fly? Lafontaine emerger in what color? There are 3901 more topics.